After seeing this adorable sweater on two of my favorite girls (Danielle and Lindsay), I knew it had to be mine one day. Although I own this in the Fall version, I love Spring's mint and gray even more. For some reason, the sweaters Old Navy has come out with for Spring feel softer and a bit thicker then the ones popular back in Fall. Paired with a statement necklace and a fun pop from raspberry heels, I felt happy and colorful for a date night with the boy. P.S. - I want another pair of J.Crew heels. I could go for one in every color. Love your sweater and necklace!!! So pretty! Loving the teal! Can you believe we are still having to wear winter looking clothes, I am ready for spring! Great look, Noelle :) I have to check out those heels!!! I came across these shoes on ebay and kicking myself for not buying...so cute on you! That sweater is absolutely fantastic. I love the mint color! Those pink heels are absolutely stunning! They really draw the eye! 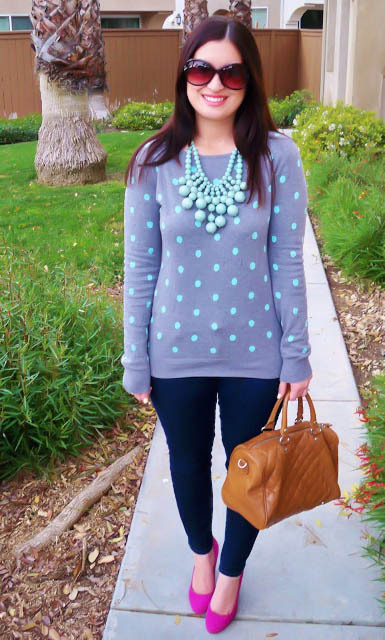 Mint, gray, and polka dots?! Oh my I think I may need to get out to Old Navy and save it for when I can fit in regular clothes again. I love your pink heels! Aw that sweater is the cutest!